Home / Angela Huffman's Reflections / I’ll be a Guest on Pat Sloan’s Podcast! I’ll be a Guest on Pat Sloan’s Podcast! I’ve been such a fan of Pat and her quilts for many years. I’m still pinching myself that I’ll be chatting with her on her talk show! I need to remember not to fan girl too much, but it might be hard to keep it in! 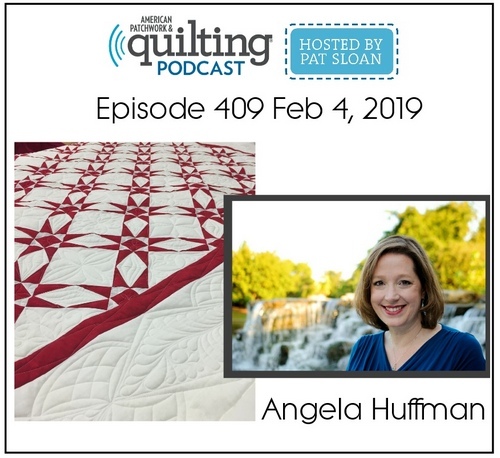 We’ll talk about my quilting journey, tips and tricks, and I’ll be making a special announcement. It would mean the world to me if you could listen in to the podcast. There are a few different ways you can listen. Listen LIVE on Monday Feb. 4. 2019 at 4:00pm EST. Click here to listen to the live radio show. After 6pm on Monday Feb. 4, 2019 you can listen to the show on Pat’s website. Click here to listen to the recorded show and past episode’s on Pat’s website. Later in the week the show will be uploaded to allpeoplequilt.com. You can also find the show on iTunes or on the Stitcher app for Android and iPhones. Search for “American Patchwork and Quilting Radio” and click that subscribe button.